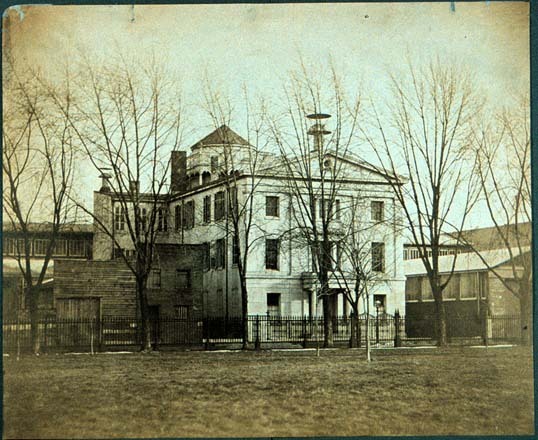 Central High School, Juniper Street south of Market Street, Philadelphia, PA, 1854. Founded in 1836, Philadelphia's all-male Central High School was the second public high school opened in the United States. The school maintained excellent academic standards while striving to provide a public education on par with the city's elite private academies. Central have moved several times since it opened in 1838. A long and protracted legal battle over coeducation ended in 1983 when federal courts upheld an earlier decision to admit qualified women. Today more than 50 percent of the student body is female. African American essayist Alain LeRoy Locke, industrialist Daniel Guggenheim, and Larry Fine of the Three Stooges are among its many distinguished alumni.